Stephen Harrod Buhner’s Ensouling Language is a manifesto arguing that creative nonfiction has fallen on hard times, at least from an aesthetic point of view. He blames the book industry and creative writing programs for the paucity of connection with the human experience. The problem, according to Buhner, is that mainstream arbiters of quality crush imagination and passion by offering easily digested but largely useless bromides like “Show don’t tell,” “Use fewer adverbs,” or the wildly off-base “Don’t give up.” Such advice misses the point, Buhner argues, because the real lesson writers need to learn is how to translate their deepest feelings to the printed page. Buhner’s book argues that any writer, no matter how mundane their subject, can achieve a sense of expansion, of traveling into larger worlds, that has always marked the best art. His writing reminds me of watching a deft psychologist pay attention to a person’s utterances and what they reveal about the speaker. He notes how one’s unresolved and ignored personal issues become revealed when writing, and how hiding those issues flatten the work. Much of Buhner’s advice about writing hinges on getting in touch with what he calls “the secret kinesis of things,” or the notion that all things have a kind of psychic “feel” to them. After asking the reader to select an object — a desk, for example, or a pen or a cup — Buhner instructs the reader to “Look at it carefully, note its shape, notice its color. Really look at it; let your visual sensing take it in. Let your eyes touch the thing as if they were fingers capable of extreme sensitivity of touch. Immerse yourself in seeing the thing that has caught your attention. Now, ask yourself, ‘How does it feel?’ ” Likewise, Buhner also exhorts writers to get in touch with the feel of certain words. Language that is saturated with feeling will, Buhner argues, serve as a bulwark against what he disparages as the “dispassionate writing” that is endemic to mainstream nonfiction. 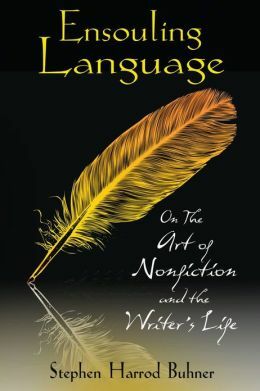 To help writers gain an appreciation for the feel of words, Buhner offers a number of exercises in “piling up meaning behind the word like water behind a dam, in creating writing that is soaked in life force.” That much of his advice comes off as similarly mystical may prove frustrating to some writers. For readers and writers who are tired of hearing the same advice that writing instructors and editors have been handing down through the ages, however, Buhner’s mystical (some might say touchy-feely) approach to writing may well be what the doctor ordered. The point Buhner is making is vital: that whatever genre we're writing, whether we're a graduate from an MFA program or not, writers must never dissociate from their feelings or the feeling of their words. Given the passionate spirit in which Ensouling Language was written, it is sure to resonate with many readers, and is certainly worth a read by anyone who wishes to become a published author.